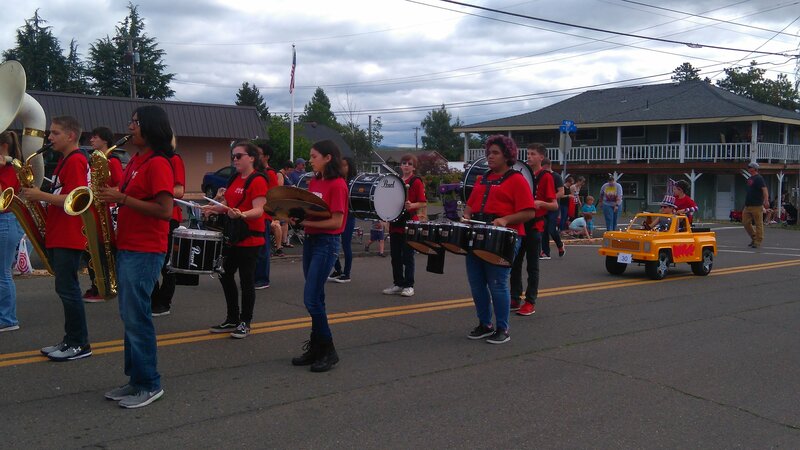 Here are a couple of pictures of the band at the Carlton Fun Days Parade on Saturday. 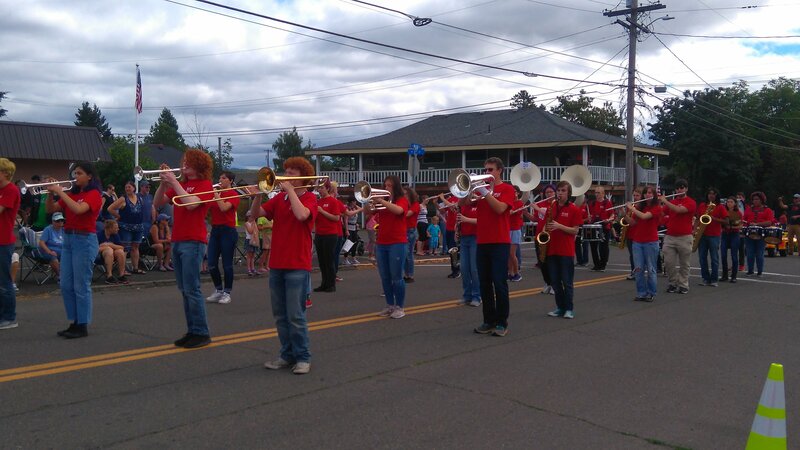 It was a perfect morning for the event and the band was well received by the crowd. The Mac Band on parade. The Mac Band Drum Line followed closely by the new truck we got to haul the trailer. A couple of us band parents also stopped by the first Guard practice of the season. (It’s hard to believe that school has only been out for a week and practice has already started for the fall show!) We got to meet two of the fabulous new instructors for the guard – there will be four all together – so this is going to be a well-rehearsed group by the time the competitions begin. On Saturday, we made contact with a few more band and guard members and got them the forms and information to sell sponsored balls for the Get the Ball Rolling Fundraiser. That means we have about half of the students signed up to earn money for their band fees. If yours hasn’t gotten the information, please drop by Incahoots and we’ll get you everything you need. Incahoots is located at 905 NE Baker Street and is open from 9:30 a.m. to 5:30 p.m. Monday through Saturday. And to help prepare for the fundraiser, you are invited to a quick planning party on Tuesday evening. We’ll meet up at 7:00 p.m. at Incahoots and figure out what needs doing and who will be doing it. It’s going to be a fun event with music and ice cream. (The fundraiser that is, not the meeting.) We’ll leave the big gate open and put out a sign so you’ll know where to find us.